An overview of all our product finishes. See resin guide down below. *Selected starter brackets are supplied in S355J2-Y05 (NORSOK approved). Typical material certificated for given products can be supplied on request, however these requirements must be made known to us prior to ordering. Stainless steel forms a protective chromium oxide layer when the alloy is exposed to air, hindering direct contact between the alloy and the corrosive environment. If a stainless steel component is damaged, a new chromium oxide layer forms, effectively re-sealing the damaged area. Most of Oglaend System’s welded products are ”pickled and passivated”. This is a process to remove the heat tint that is created during welding. The heat tint is produced by an increase in the density of chromium at the surface and a corresponding decrease in the area below. As a result, the affected region is vulnerable to corrosion and less aesthetically pleasing. Both problems are efficiently solved through ”pickling and passivation”, which allows a new protective chromium oxide layer to be established. Oglaend System has a long track record from the North Sea using these methods with great success. Hot dip galvanized steel is coated by a protective layer of zinc. The zinc layer offers solid protection against most corrosive environments. This is due to its low electrode potential, which allows it to act as a sacrificial anode. The zinc therefore corrodes slowly instead of the material it protects. 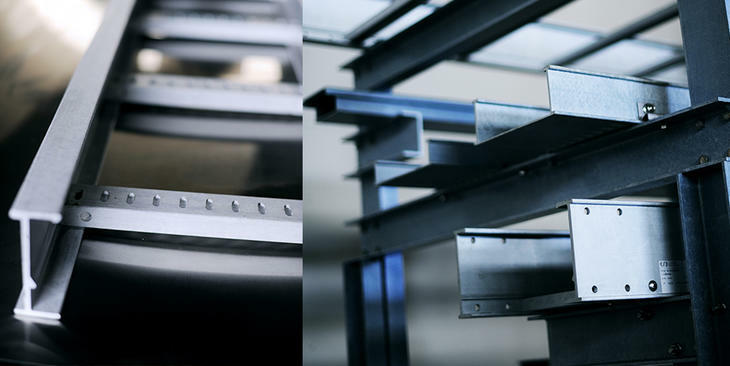 Oglaend System’s HDG steel components are made in accordance with European standard EN ISO 1461. Adhering to the standard, components in material thickness from 1.5 - 3.0 mm receive a minimum 45 μm coating. EN ISO 12944-2 offers guidance that a zinc coating of 45 μm delivers corrosion protection in the order of 21-64 years in an environment with corrosion class C3. For less corrosive environments using pre-galvanized (PG) components is often a preferable alternative. ZM is a metallic coating which offers excellent corrosion protection suitable up to C4 environments. The coating consists of zinc, aluminium (3.5%) and magnesium (3%) which offers far better anti corrosion resistance with thinner coatings than traditional hot dipped galvanized coatings. ZM coated steel is pre-galvanized to 25 μm/ per side which simplifies logistics and improves CO2 footprint, and like HDG, benefits from “self healing” for cuts and holes made post coating. In addition, ZM coated products are both lighter and more cost effective than similar products in HDG finish. ZM is included in European Standard EN 10346. Pre-Galvanized steel has been subjected to a process whereby sheet steel is coated with a thin layer of zinc, which gives it a bright appearance. This zinc layer of 20 μm thickness in accordance with EN 10346, offers protection due to its low electrode potential and slow corrosion rate. 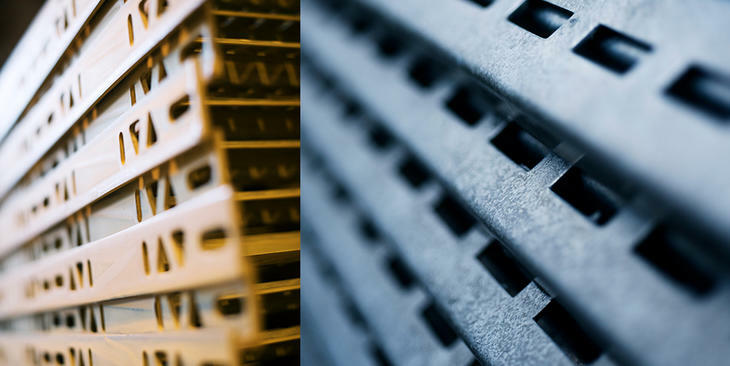 As the process is carried out on raw materials prior to cutting and bending, PG is a cost-efficient process. Products in PG are suited for installation in environements with a low corrosion rate. Certain products are delivered factory primed, which acts as a protective coating during transport and storage, thus preventing corrosion. When the products are exposed to corrosive environments, a secondary coating must be applied to ensure optimal life expectancy. The primer has good adhesion and gives the top coat maximum coverage. Where aesthetics or additional surface protection is relevant, some products can be supplied with surface coatings such as epoxy powder coating. These coatings are available in a wide range of colours on request. Coated products may require additional grounding. Aluminium is typically used in applications where minimal weight is key. When exposed to water it forms a coherent surface oxide preventing the aluminium to corrode. 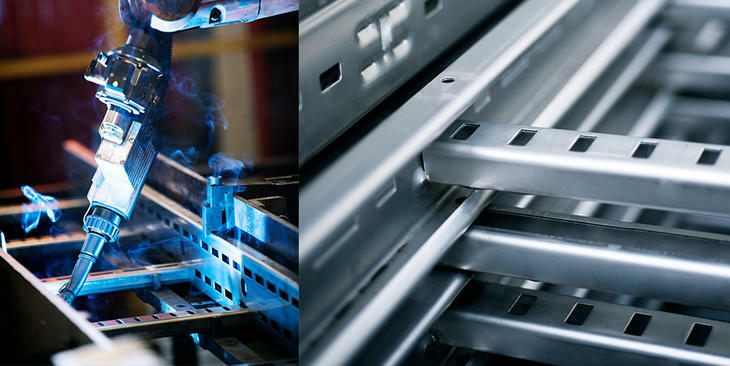 Oglaend System’s aluminium components are made in 5052 H22, 6062 and 5754 H22 quality. Oglaend System offers a range of resins to match the needs of our customers. From our standard polyester resin to our high performance olstar resin, we can meet your chemical, fire, smoke and toxicity requirements. To specify the desired resin, the standard FRP article numbers are prefixed with the resin code shown below. GRP/FRP: Note, the pultruded process of manufacture means there is no difference in GRP/FRP material types. Polyester is the most widely used resin system. It offers good weathering properties with resistance to ultraviolet light and has good corrosion resistance. The resin can also be formulated to meet specific fire and smoke standards and can be supplied with conductive properties. Our standard polyester resin product range is UL approved. Resin Code: ’A’ for FOE Items. ’C1A’ for FTE Items. Polyester resin can be given anti-static properties to meet project requirements. Anti-static resins contain carbon powder, which increases the conductivity of the material and as a result this material requires grounding. Vinyl Ester resins offer better corrosion resistance and heat resistance than polyester resin. It is suitable in industries using heavy chemical and caustic materials. Oglaend Low Smoke & Toxicity Acrylic Resin is ideal for use in enclosed areas, mass transit and tunnels. This resin exceeds the low smoke and toxicity properties of other resins while maintaining good fire performance properties. This is our Acrylic resin with Anti-static properties (and therefore should be grounded). This resin is used for projects that require ABS or BV certification.